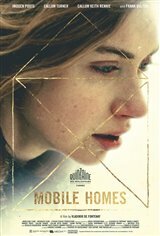 In forgotten towns along the American border, Ali (Imogen Poots), the young mother of an eight-year-old-son named Bone (Frank Oulton), drifts from one filthy motel to the next with her son and her criminal boyfriend Evan (Callum Turner). The three pull off hustle after hustle, including dining and dashing, staging cockfights and teaching Bone to sell drugs. Finally Ali comes to realize that the squalid life she's providing for her son isn't cutting it. She and Bone run away from Evan and wind up in a mobile home community, which opens her eyes to providing Bone with a different, better lifestyle.